The Shopsmith 11" Bandsaw brings unique, work-saving capabilities to your shop. Use it for: • Cutting Curves • Compound Cuts • Resawing • Cutting thick stock • Pad sawing ... and more. Rating: 5 out of 5 My mark 5 was bought in 1982 by my brother he has passed on the mark 5 was passed on to me.I have a new 14 inch band saw in my workshop but I like using the one on the shopsmith most of the time for scroll work on the wooden toys I make for the kids in the neighbor hood.One other thing I am 69 years old the mark 5 is so well made it will go to one of my grand kids. Rating: 5 out of 5 My bandsaw, like my Mark 510, was made in 1997. I bought it used in 2012. Although smaller than many standalone saws, it does everything I have asked of it. I have re-sawn hardwood lumber, helped make furniture, helped in an extensive landscaping project that included fencing and trellises. It is smooth and quiet. I have purchased the upgraded table set up. I clean it after every use and often change blades when I need the 1/2 inch blade for heavy cuts in hardwood. I de-tension the blade when I take it off the saw, as suggested by Shopsmith. Like all my Shopsmith tools, I appreciate how easily I can install it on my Mark 510 (upgraded to 520), then store it for future use. Great tool that perfectly fits the Shopsmith theme that enables a space challenged woodworker to have a fully functioning shop. Rating: 5 out of 5 I'm glad I don't take the bad reviews to heart. I would of bought a Grizzly "Chinese" band saw. I purchased my 1983 Shop Smith just 3 weeks ago needing a little TLC. Too include the band saw, after following the owners manual and service manual I can say I have a great little band saw. No it will never resaw 6.5 to 16 inch wood. But then again, when will I ever need to. My band saw was built in 1989. With a freshly cleaned up set of bearings,table,wheels,and guide rollers all cleaned and polished. It runs just like new. I expect to get at least 10 to 15 years out of it. Being 65, I believe that should about do it. Yes, there is a noise when you run it, it is called, machinery. Now the new band saw that SHOP SMITH has, has a bigger table, more modern materials. But my saw and the new saw have a couple things in common, built like a tank... in America and parts are still available for my saw. Oh, that's right, both saws are still made the same way,even being 30 years apart. Good luck with that "overseas" saw in 30 years. Rating: 2 out of 5 After using this bandsaw for 6-8 months, the best thing I can say about it is that it's better than no bandsaw at all. Shopsmith says it has a 6" depth of cut, but according to my ruler, it will only cut 5-1/4". However, I did just discover that if you remove the top bolt on the blade guard, it increases the depth to 5-7/8." Anyway, I think Shopsmith owners deserve the option of having a well made 14" bandsaw, especially now that the machines are capable of producing 2 HP. That is really a lot of wasted horsepower on a tiny bandsaw ilke this one. Yea, I know a 14" saw would be much heavier and like every other Shopsmith item, it would cost a fortune. However, I would bet that most woodworkers need a bandsaw very frequently, and would be happy to pay the exorbitant price for a good 14" one; or if not, they have the option to just purchase the existing saw. I would have already purchased a separate 14" saw if I only had a place to put it. Rating: 5 out of 5 noise when band saw is turned on noise remains whils under load also @ why? Rating: 4 out of 5 This bandsaw is excellent for resawing, rippig, tight cuts and cutting different materials. I can cut consistent 1/16" thick slices from a 5" wide board. It has a more powerful motor than most (when used on the Mark V) so is great for cutting metals, plastics, etc. I can cut 1" diameter circles in 1 1/2" thick stock. I often use the bandsaw for ripping in place of the table saw. There is so much you can do with this tool when you know the tips and tricks. 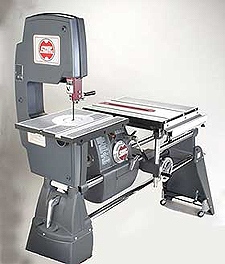 Rating: 4 out of 5 I have had my Shopsmith bandsaw sine 1984 and it works for me. I use a Wood Slicer blade from Highland Woodworking for re-sawing and get great results. A larger band saw might be nice for a larger shop but the Shopsmith Bandsaw does most of what I need a bandsaw to do. Rating: 3 out of 5 At this point I wish I had bought separate tools for all of my woodworking. I am not happy with the bandsaws performance. Re-sawing does not work for me even with a 1/2 inch blade. Thinner cuts on the saw are fine. I once had a Craftsman bandsaw that had a circle cutting attachment that was much easier to use than the one for my Shopsmith. Getting it aligned perfectly is a pain. The craftsman attached to the blade guide and needed no alignment. I have now purchased a separate lathe. Next a bandsaw. Rating: 5 out of 5 Mine's fifty years old and does better work than bigger and more costly machines. Great quality tool. Rating: 5 out of 5 Mine works great, I would hate to be without it. One of the most used additions to my Mark V.